With two strong showings in victories over western rivals Vancouver and Columbus, the Calgary Flames have once again found winning ways. With three days between contests, the Flames will hope to use the extra rest against an Oilers team that has been firing on all cylinders. The Flames are currently ranked at or near the top of league statistical categories in both fights and goals for. The Oilers have rattled off three wins in a row, beating both the Canucks and Blue Jackets, as well as the Minnesota Wild. Perhaps the most notable of those three victories came most recently against the Columbus Blue Jackets. With former Oiler Mathieu Garon starting, the Oilers went down 4-1 before storming back to triumph 6-4. This comeback was helped along on the strength of a five point performance by Dustin Penner. The Oilers will hope the carry over that momentum from Thursday night into tonight’s tilt with the Flames. In the last Battle of Alberta, the Calgary Flames escaped with a 4-3 shootout victory. With Edmonton leading 3-2 late in the third period, Rene Bourque deflected a Jay Bouwmeester point shot to tie the game with only 1.5 seconds left on the clock. This effort (along with his two assists) was enough to earn Bourque the first star nod. Nikolai Khabibulin and Denis Grebeshkov were given the second and third stars, respectively. Calgary- Fans can expect to see Miikka Kiprusoff between the pipes again for the Flames. 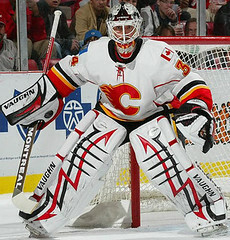 So far this season Kiprusoff is sporting a 6-1-1 record alongside a 0.902 SV% and 3.23 GAA. His backup, Curtis McElhinney is 0-1-0 in one start, with a 0.862 SV% and 4.00 GAA. Edmonton- Nikolai Khabibulin is most likely to get the start tonight for the Oilers. 5-2-1 in his first eight games, Khabibulin has a 0.907 SV% and 2.96 GAA. 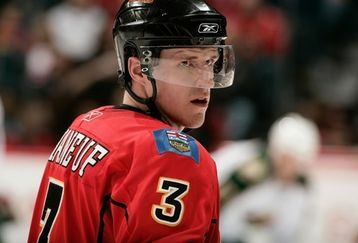 He will be looking to exact revenge on the Flames who are responsible for the only two regulation blemishes in his record. Jeff Deslauriers, is 1-0-0 with a 0.976 SV% paired with a 1.00 GAA. Calgary- After starting the season slow, Jarome Iginla lit it up on Tuesday against the Columbus Blue Jackets. Seven points in nine games is uncharacteristically low production for Iginla. Expect him to keep ramping up his play and those numbers to keep increasing. Another reason to watch Iginla is because of the collision that occurred between him and Oilers defenseman Sheldon Souray the last time these teams met. Whether or not the Oilers players look for more payback is yet to be seen, but in the Battle of Alberta, nothing is ever forgotten. After beginning the season near the bottom of Calgary’s +/- rankings, Robyn Regehr has climbed back to respectability in that category. Currently sitting at -1, Ales Hemsky can expect to have Regehr hounding him all night long. Edmonton- The big man to watch in Edmonton is the big man himself. Dustin Penner currently leads the team with 14 points in nine games, and does not seem to be slowing. With a five point performance against Columbus on Thursday, Penner is hot and fans can expect to see him driving the net hard tonight against Calgary. One of the Oilers key leaders, Shawn Horcoff has been one of very few disappointments in Oil Country this season. Usually relied on for a solid two-way presence, Horcoff has only provided a goal and an assist, alongside an uncharacteristically low -4 rating. Calgary- Brandon Prust is the leading scrapper for the Flames. He has gone toe-to-toe with Zack Stortini in the past, and don’t be surprised if it happens again tonight. Edmonton- Zack Stortini is the muscle roaming the ice for the Oilers. As mentioned above, expect a Prust-Stortini rematch. Calgary- The Flames powerplay has cooled off as of late, but is still operating at a 28.6% efficiency rate. Rene Bourque and Dion Phaneuf lead the team in powerplay markers with two apiece. The Flames penalty kill, following early season struggles, has recovered to 76.5% efficiency. This is still an area in need of improvement for Brent Sutter’s Flames. Edmonton- The Oilers powerplay is firing away respectably at 22.9%. Eight different Oilers have made their mark on the powerplay so far this season. Edmonton’s penalty kill is turning away opponents at a slightly better rate than the Flames, with a 80.6% efficiency. Calgary- David Moss (upper body) is questionable for tonight’s game. Edmonton- Gilbert Brule (flu), Steve Staios (concussion), and Ryan Stone (leg) are all questionable for tonight’s game. 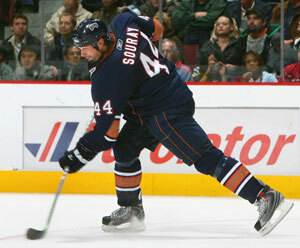 Fernando Pisani (back) and Sheldon Souray (concussion) are out until late October at the earliest, while Marc Pouliot (sports hernia) is out until late December. ~ by manovrboard on October 24, 2009.